The Packers are locked and loaded and are ready to conquer the NFC. Green Bay, led by a high-powered offense and a young and hungry defense, have their sights set on winning the NFC North and bringing home another Super Bowl title. Division rivals, the Chicago Bears and the Detroit Lions will look to spoil the Packers plans. Grab your Green Bay Packers tickets and head over to Lambeau Fields to help lead your team to victory! For the last nine seasons, the Green Bay Packers have shown consistent performance. They qualified for the playoffs consecutively from 2009 to 2016 and during that time, they have won five division titles, one conference title and one Super Bowl Championship. They did not qualify for the playoffs in 2017 but they are back this season, ready to take it all. The 2018 season is now just around the corner so, will The Green and Gold be able to carry their current form into the next campaign and win their fifth Super Bowl Championship? Only Green Bay Packers Season tickets will tell. Formed almost a century ago in 1919 by George Whitney Calhoun and Earl Curly Lambeau, the Green Bay Packers have had an incredible run so far. The team has delivered memorable moments over the years and here we look at a few of them. Winning the first two Super Bowl Championships - The first Super Bowl took place in 1966 and it was the Green Bay Packers who won the top prize that year by defeating the Kansas City Chiefs in an intriguing game. The duel was viewed by millions around the globe and it became the moment that would go on to define their reign of dominance. One year later, The Packers repeated the feat and clinched their second Super Bowl Championship. This time, they came out victorious against the oakland Raiders, 33-14. Dominating the 1996 season -After 1987, the Green Bay Packers went through a rough patch and didn’t make it to the playoffs for quite a few years. However, the team found its form once again and delivered one of their best seasons in 1996. That year, they won their third Super Bowl title by emerging victorious against the New England Patriots, 35-21. The Green Bay Packers have famous rivalries with teams like, the Minnesota Vikings and the Detroit Lions. Packers – Vikings rivalry - The rivalry between the Green Bay Packers and the Minnesota Vikings began in 1961. Both teams are in the same division and this is a big reason why their rivalry is considered one of the most intense in the NFL. The two sides have delivered some epic moments over the years too. They last played each other on December 24, 2016 and the Packers won the game 38-25. Packers – Lions rivalry - The first time, the Green Bay Packers met the Detroit Lions was in 1930 when the latter was known as the Portsmouth Spartans. The Lions later moved to the city of Detroit which led to the two sides becoming division rivals. Since 1932, both teams have been colliding on at least two occasions every year. This is why it is the longest continuously-running rivalry in the NFL. The most recent game these two sides played was in 2017 where the Packers won the duel by defeating the Lions, 31-24. During their early years, the Packers had key players on their roster who delivered some of the most memorable performances in the franchise’s history. These players were Willie Davis, Forrest Gregg, Clarke Hinkle and Cal Hubbard. All four were inducted into the Green Bay Packers Pro Football Hall of Fame. However, some of the greatest players on the Green Bay Packers include the legendary QB Bart Starr. He led the Packers to five NFL titles from 1961 till 1967. Brett Favre is another QB who is solely responsible for revitalizing Green Bay football. And then there is Ray Nitschke who checked all the boxes for a mean defenseman and was one of the most effective line backers of his era. Iconic Lambeau Field is a magical place to see a football game and no matter how cold it gets, the Packers' faithful fans will fill up the stadium to capacity. Packers fans can sit up close and personal and take part in the legendary Lambeau Leap or explore the history of the franchise in the Packers Hall of Fame. It is always a treat to watch the Green Bay Packers play live. You can now watch them go head to head with not just their arch rivals but also other teams in the NFL. So, what are you waiting for? Get your hands on Green Bay Packers Season tickets and watch as they deliver thrilling performances this season. Our process for purchasing cheap Green Bay Packers tickets is simple and fast. There are so many online ticketing sites, that it can be hard for customers to find the right place to buy Green Bay Packers tickets at the cheapest price. At ScoreBig we think of our customers first and foremost. We offer daily deals for Green Bay Packers events, so our customers can get the best seats for the best prices. ScoreBig will always go above and beyond to offer the cheapest Green Bay Packers tickets on the market. The Green Bay Packers schedule above, displays all available events for 2019 and 2020. Once you find the event that you would like to go to, click the red “Get Tickets” button. It is located on the right-hand side of the event listing, it will take you to an Green Bay Packers event ticket page. ScoreBig's event ticket page will display all available Green Bay Packers tickets for that event. On the event ticket page to help with your search for the right Green Bay Packers tickets, use the filters at the top to select quantity, price range, and more. There is also an interactive seating chart so you can pick where you want to sit. When you are ready to buy a ticket, click on the listing, and you will be directed to ScoreBig's checkout page. Upon completion of the information fields, your order will be processed and your Green Bay Packers tickets will be delivered via email, mail, or to your mobile device. What makes ScoreBig’s site stand out from the rest? We are constantly analyzing our competitors to improve our site, service, and prices. ScoreBig.com employees strive to offer the best process and experience to buy cheap Green Bay Packers tickets. Our goal is to get you the best seats to Green Bay Packers events. We offer daily discounts on our site and for special promotions check out our newsletter. 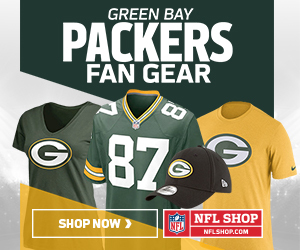 If there are no Green Bay Packers events currently available, you can use our search feature at the top of the page to see a list of all popular events going on near you. No matter your price point, we have all the best deals and discounts on Green Bay Packers tickets. For more information on prices of Green Bay Packers tickets and the schedule for Green Bay Packers, check out our listings above. The last thing you want to find out is when the Green Bay Packers event you wanted to go to is sold-out. Don’t worry in many cases ScoreBig has affordable tickets to sold out events. We sell tickets from GA all the way to premium seating and parking. Skip the scalpers in the parking lot and get your tickets online from top Green Bay Packers ticket brokers. We get you in all events, buy your Green Bay Packers tickets here from a brand that many trust and rely on for all their ticketing needs. ScoreBig offers a 100% money-back guarantee. If you have been in search of cheap tickets for Green Bay Packers, ScoreBig by far is the best option. That’s why ScoreBig has more loyal customers than any other ticketing site. Shop at ScoreBig for safe and secure Green Bay Packers event tickets.